There is a lightness of touch and tremendous skill in playing New Orleans jazz, ragtime and blues on an album that whilst remaining true to the loose tradition is also incredibly fresh and contains plenty of improvisation. 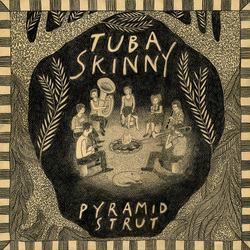 If ever this music was successfully updated for the 21st century, on this their 5th album, Tuba Skinny most certainly manage it. No coincidence since the previous four recordings are more than worthy of your investigation! Terrific album that rocks it’s way through edgy country and blues often blending the two genres, with a variety of tempos and emotions, often echoing but updating ‘cowpunk.’ Eleven very good self written songs that suit his raw melodic vocals, on occasions sounding a little like Otis Gibbs, even if Miller rocks much harder! This is a four song e.p that has echoes of the great Townes in as much as LQ writes and sings from the heart and records his ethereal wistful songs with a sparseness that few others can match. There is a mellifluous feel to these slow moody tales that is belied by the intensity and depth of the lyrics. Terrific album of folk, country and even a little bluesiness, all with a sparse instrumentation and some with just acoustic guitar, but songs of the highest quality by a British singer songwriter who maintains a consistent excellence throughout. Brilliant album that has it’s roots in dark Appalachian country music but also veers into rock and roll, R ‘n’ B, even a little gypsy/hillbilly jazz. Great songs, beautifully sung and played and comparable to virtually no one else! Highly unusual seven track mini album that is folksy, beautifully written, arranged, sung and played by a talented five piece band that includes cello and violin and Betty Jaegar’s beautiful ethereal vocals. All of which fits them into a genre of one! They have got to be the most consistently excellent band around. No one plays country rock as well as they do, obviously helped by some great songs that are full of emotion, with expert playing and an unsurpassable husband and wife team on lead vocals. Tremendous album! Six terrific tracks that veer from Uncle Tupelo type alt. country to almost classic country rock. Those half dozen songs should let you know that when we get a full album from them it should really be something special. A relatively ‘old’ album but just has to get mentioned for the huge quality, commitment, authenticity and no little skill that they bring to their ‘old timey’ or ‘hillbilly’ music. I never tire of this album! A mighty improvement on his previous offering. This is a lot more of a country or roots orientated recording, beautifully played and sung and some very good songs. Lovely dramatic attacking quality to her vocals on every track irrespective of content. Beautifully contructed, arranged and played album of modern folk songs, but it is her voice that adds the extra quality to the songs and consequently lifts the album way above most of her peers. The usual high quality sometimes punked up (and sometimes straight!) country and blues that owes no allegiance to any particular genre other than their own. Holly, despite living in the U.S for years really is a British national treasure and a truly one off original. This is an album that is so good I still can’t get my head around just how good it is! A brilliant, classic ‘American Roots’ album by a nine piece from Oxford, UK. This debut album puts them way up there with the likes of the Good Luck Thrift Store Outfit and Sumner Brothers. In terms of modern bands I can’t come up with higher praise!